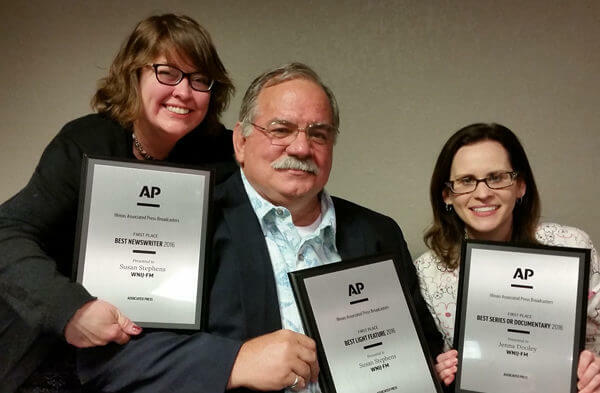 Two WNIJ reporters have collected a total of three first-place awards in the annual Illinois Associated Press Broadcasters competition for 2016. The awards were presented Saturday, April 22, at the Illinois News Broadcasters Association (INBA) gathering in Urbana. There were 12 award categories in each division, and WNIJ News won three of them in the Local Radio Division. INBA is an organization of professional journalists from radio and television stations which serve Illinois audiences. Senior Reporter Susan Stephens won in the Best Light Feature category for her heartwarming “A Humble Chore Could Change Lives,” about special-education students at Beloit Memorial High School who helped lower-income students learn how to do laundry. Stephens was also honored as Best Newswriter for the consistent high quality of her work in a wide range of stories. WNIJ producer Jessie Schlacks was recently recognized by Northern Illinois University, where she studies journalism. She received the 2017 Dean’s Award – a combined award from the College of Liberal Arts and Sciences and the Department of Communication – for her academic achievements and her contribution to media.